This is our first outing with Tesoro and from what we’ve seen, we’ve been impressed. 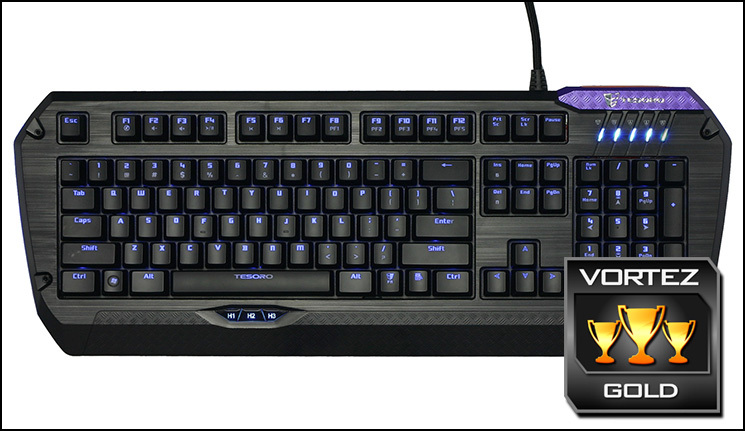 With the mechanical gaming keyboard sector being saturated by numerous brands it takes a stand-out product to move into the spotlight and Lobera Supreme certainly has the attributes to do so. Aesthetics are just as important as the actual functionality of a keyboard for the gamer and Lobera Supreme has the styling and finesse other brands aspire to. We love the brushed aluminium appearance and the diamond pattern wrist support. The option to configure and make use of the LED lighting is also a highlight because you can choose from a selection of 16.8M colours. The inclusion of USB ports and audio jacks is handy and the added extra of being able to boost the power of the USB ports for smartphone charging via the DC-in cable is also very useful. The only real disappointment that we encountered is the software. The features are all there and they work well, but the software that marries them up isn’t initiative and at times can be tricky to use. We’d like to see an interface which is more streamline but also helpful in allowing the user to perform specific tasks. Costing £80 GBP / $150 USD – Lobera Supreme is accurately priced and considering all the high-end features that are on offer, this keyboard represents great value. Lobera Supreme is furnished with a number of exciting features which gamers are sure to find useful. It’s available in an assortment of different Kailh switch types and we think it looks rather smart too.